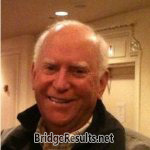 Burgess Brier and Buzz Hunt scored 0.28 masterpoints with a 54.55% game at St. George Bridge Clubs. See full results of this game. Buzz Hunt and Burgess Brier scored 0.34 masterpoints with a 56.25% game at St. George Bridge Clubs. See full results of this game.